This wonderful, deciduous climber has delightfully fragrant whorls of creamy-white flowers which are often tinted with pink. 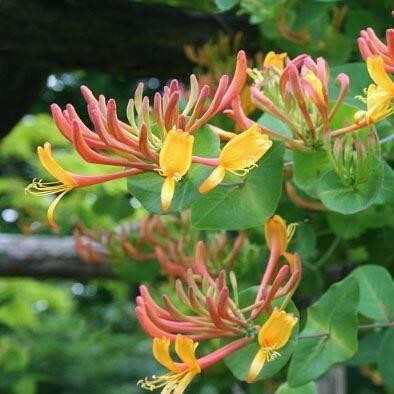 Bloom in late Spring, the flowers of this lovely Lonicera will last for many weeks. This variety if often referred to as Perfoliate Honeysuckle, this is because the leaves are 'perfoliate', meaning that the stem appears as though it is going through the centre of a rounded leaf. The perfect plant for training against a trellis, wall or fence. Supplied in approx. 2-3 litre containers.